Parai Tenggiri is a beach that located in the area of Matras Sungailiat, about 40 km from Depati Amir Airport, Pangkalpinang. Sinar Baru Village, Sungailiat District, Bangka, Bangka Belitung province. 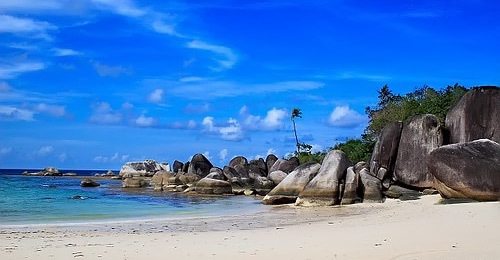 Parai Tenggiri is the most popular and exclusive beaches in Bangka Belitung. The beach was quite flat and has gentle waves. Facilities at this beach are including hotel, outbound and water sports playing. At this beach, you can swimming and playing in the water along the beach with white sand and green sea water. Parai Beach is the ideal place for chilling and relaxing enjoying the nuance of the beach and the green atmosphere. In Parai Tenggiri you can also see the large boulders granite in many unique shapes that cannot be found in other areas. This makes the rocks on this beach scenery becomes even more special and often jaw-dropping the visitors who come. From the top of the rocks, the visitors can sit back to enjoy the beauty of the South China Sea that is calm and choppy. At night, the visitors can freely enjoy the atmosphere of the night on the beach which is colored by the light from ships that sailing while enjoying fries, fried banana cheese, compote pumpkin, or warm drink that can be purchased at a nearby restaurant. Today, the area of Parai Tenggiri Beach is designated as a green tourist area called Parai Green Resort. In other hand, Matras Beach is also very beautiful and ramps. This beach is located in the village of Sinar Baru, Sungailiat District, at the eastern part of Bangka Island Sea, which is about 40 km from Pangkalpinang or 7 km from Sungailiat City. This beach has fine white sand, waving palm trees and natural river flow. The place is comfortable and quiet that will provide flexibility for you to eat food while leaning on natural rocks and enjoy the beauty atmosphere around the beach. There are many airlines that serve the airport for flights to Depati Amir Pangkalpinang such as Garuda, Lion Air, Batavia Air, Sriwijaya Air and others. To arrive at this beach, visitors can use various types of vehicles that can be rented in Depati Amir. If you want to use public transportation, from Pangkalpinang the visitors can take Colt, majoring Pangkalpinang-Sungailiat with cost Rp. 6.000, -. Meanwhile, if you want to Matras Beach you can use a private car or taxi from Sungailiat or Pangkalpinang. The trip to Matras Beach takes approximately 1 hour by the road that up and down. The entrance fee to this beach is around Rp 2,000, - to 5,000, - per person.